You only need one solution with Slusarski. We handle projects of all scopes, from small residential jobs to challenging commercial and industrial ventures. Here, you’ll find a complete, comprehensive, and fully integrated team, ready to turn your idea into a finished project. From the beginning of a project to its completion, our local team has your project covered. With comprehensive services that involve all stages of job, Slusarski helps you get it done the right way, the first time. We offer preconstruction services including consultation, project management, civil engineering design, site demolition and development, design-build construction management, and more. Before your project begins, get professional feedback, guidance, and even alternative suggestions from our team of project managers. Our team works together to help you find the best solution for your goals. Even if you’ve already started your project, our team can offer oversite and management in any phase of construction. Bring us in when you encounter challenges or unforeseen complexities in your project, or need alternative ideas. Slusarski has the capabilities and capacity to consult on or manage your job – no matter the size or scope – from beginning to end. Our team includes a fully licensed Civil Professional Engineer (P.E.). This allows us to offer you professional, qualified, experienced design services for site development, excavation, and construction. Civil engineers can save time and money on your project by identifying and mitigating potential risks as well as discovering less costly design alternatives. Our engineers are an integral part of our team, assuring that you receive only the most complete, comprehensive service available. Have an idea for a project? Bring it to Slusarski. Tell us what you need, and we’ll handle the project from concept to completion. We can take your idea and develop a civil engineering design for it, obtain the necessary approvals for the project, and build it. Slusarski also works with traditional bid-build projects. We will provide you with a bid based on drawings created by a civil engineering consultant. 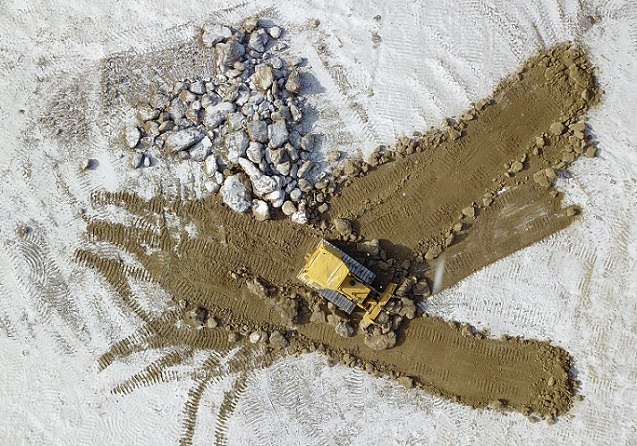 Our team is capable of overseeing and completing your entire project, from research, surveying, obtaining approvals, to design creation, construction, excavation, and demolition. Ready your site for development with Slusarski, your local solution provider. We’ll help keep your project within budget and get it done on time. Site development comes with a variety of challenges – from difficult construction requirements to tough site conditions and short time frame requirements. When you partner with our team, we’ve got these things covered. No need to worry; Slusarski has decades of experience, top-of-the-line equipment, and time-proven processes that get the job done the right way, the first time. 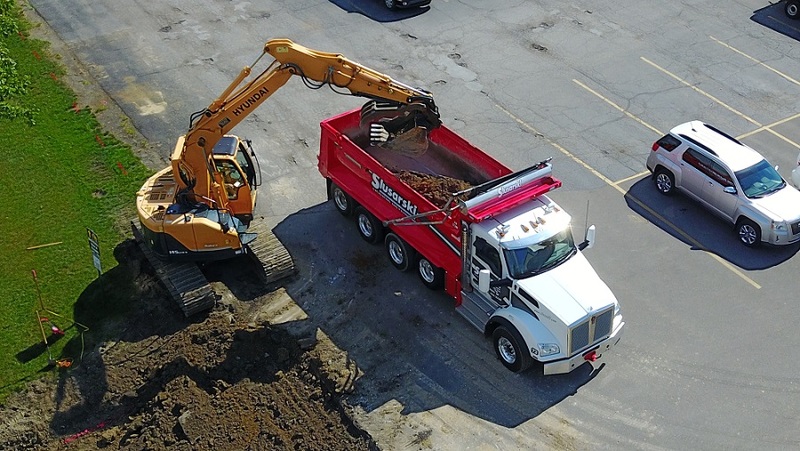 We have the people and equipment to perform all of your excavation and earthwork needs: Underground utility installation, earth moving, grading, septic system installation, storm sewer and detention pond installation, and many other services. Commercial, industrial, and residential asphalt paving services including parking lots, resurfacing, and demolition/repaving, in addition to other services. Protect your asphalt pavement with local, high-quality sealcoating and striping. Maintain your parking lots and/or driveways to extend the life of your asphalt. Slusarski Materials will provide crushed concrete and asphalt aggregates made from recycled concrete rubble and asphalt. Also available is excellent topsoil screened to remove debris. 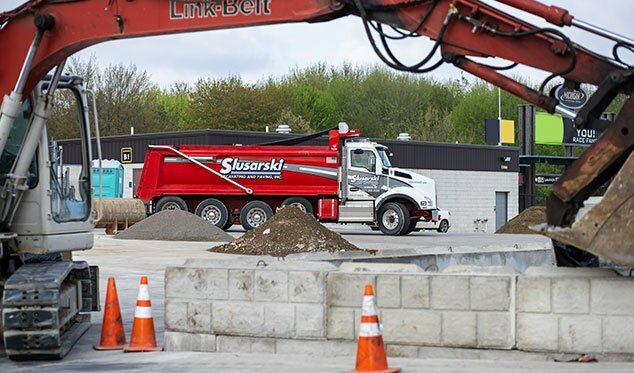 Slusarski Materials also accepts concrete and asphalt for disposal that is clean and free of debris or dirt. Slusarski can handle your largest, most challenging projects in-house. Our fully integrated, balanced, and complete service offerings allow us to serve you from the beginning of your project to the end. We are the complete solution provider for your sitework needs, from concept to completion.